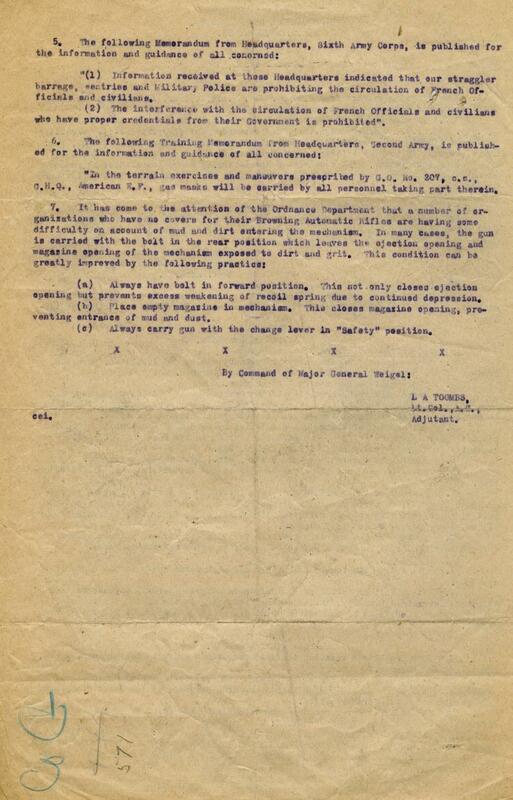 This bulletin dated November 25th, 1918 was sent out by the Headquarters of the 88th Division which was stationed in France. 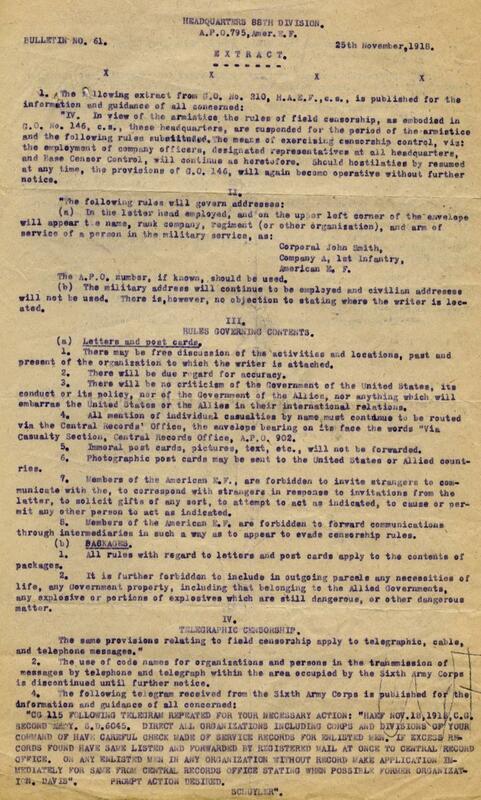 This bulletin concerned the changes in censorship rules that needed to be made because of the signing of the Armistice. Those writing home to their families and friends could now freely discuss their activities as well as their locations. They could also write about details from the past that they hadn’t been able to share before and write where they were headed to next. This was because their mail was no longer in danger of being read by the Germans. However, one of the censorship rules that remained was not being able to freely write criticisms about the American government and Allied government. 1. There may be free discussion of the activities and locations, past and present of the organization to which the writer is attached. 2. There will be due regard for accuracy. 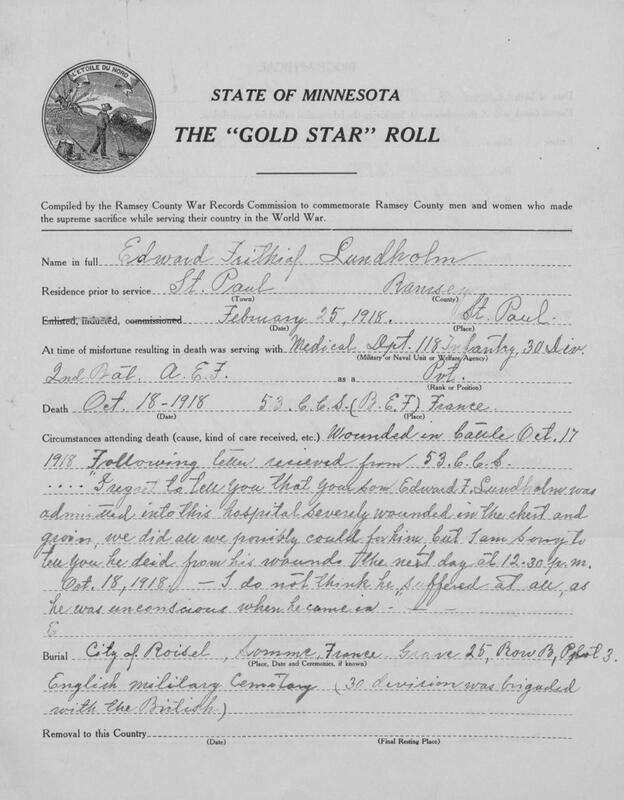 This is the Gold Star Roll file of Private Edward Lundholm of Minneapolis, who was serving with the Medical Department of the 118th Infantry, 30th Division, 2nd Battalion, A.E.F. Today is the date that his mother officially learned of his death, although he died of wounds received in action on October 18th. His division was fighting in the "bloody battle at Somme". Lundholm received his fatal wounds when he was providing aid to a fellow wounded soldier. 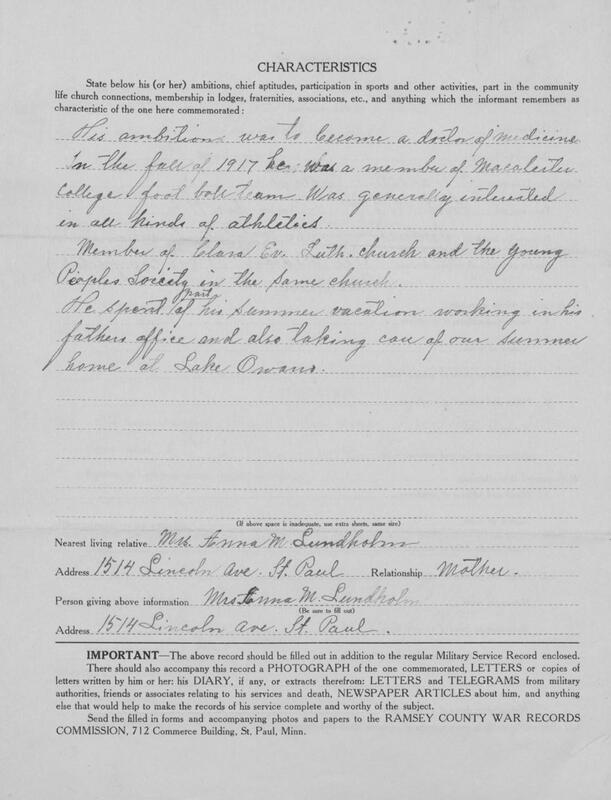 Lundholm's mother hand copied a number of letters that he had written home, including the last letter he had sent before his death. 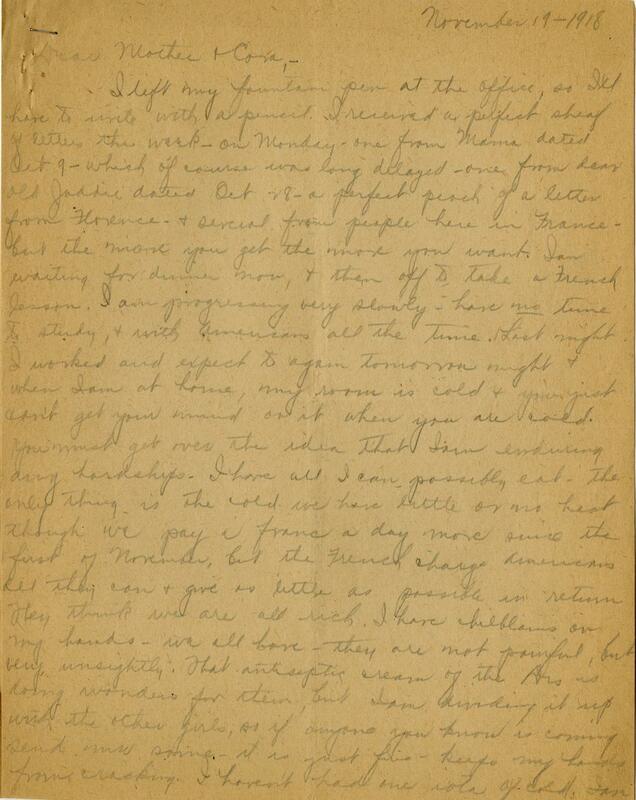 The letter, written on October 4th, talks about his recent activities and the way that war changes men. He also mentions that if he pulls through this war he will be a different person than when he left home. 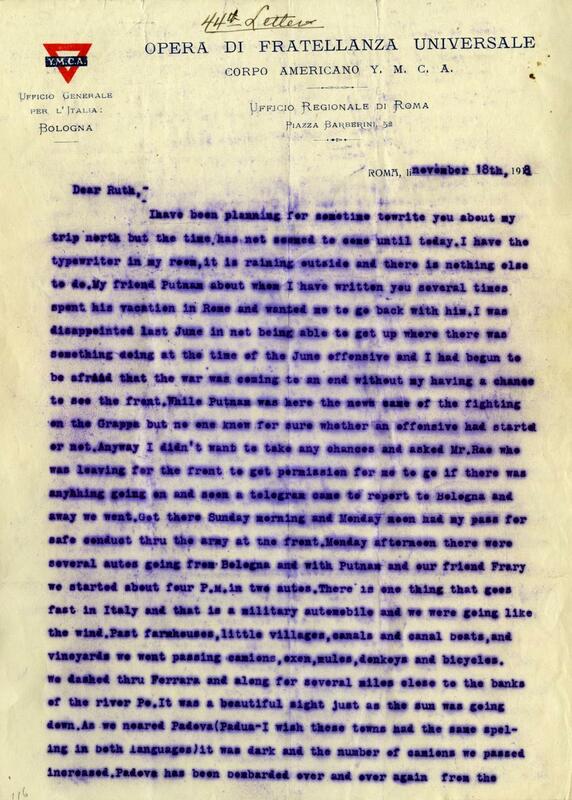 In a previous letter he writes that he finds himself constantly on duty caring for the wounded on the field of battle. 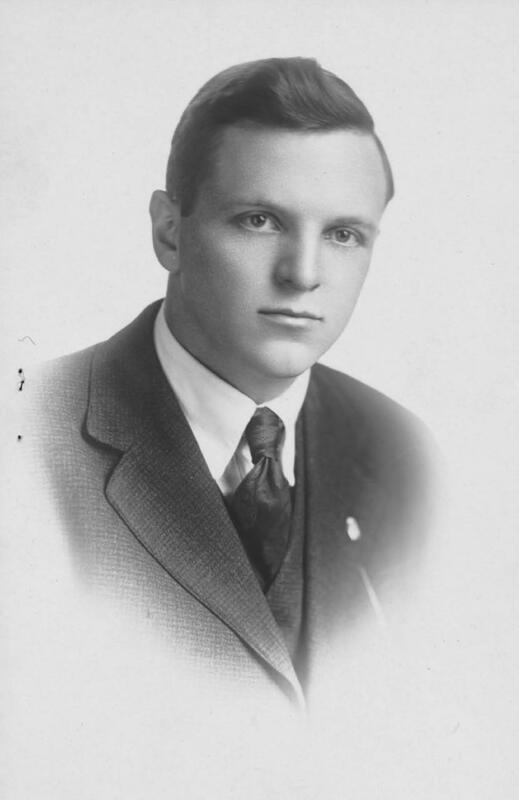 Edward Lundholm paid the ultimate price in war while he was attempting to save the lives of others. 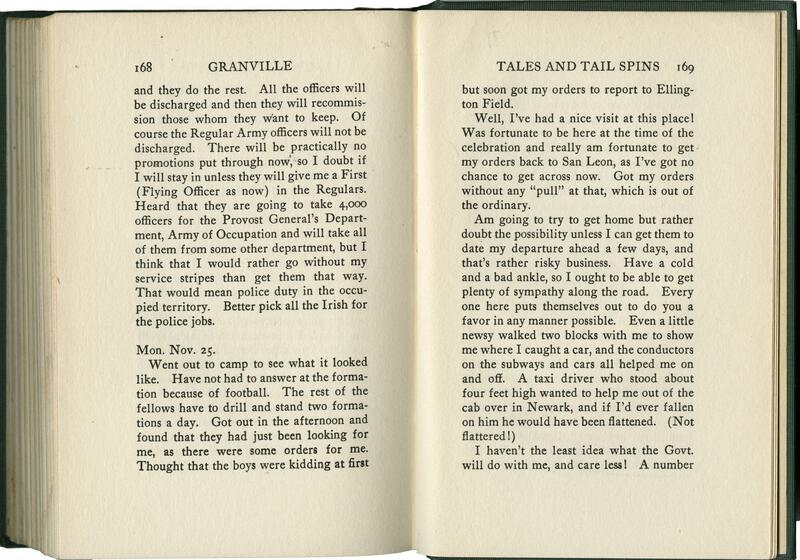 This is the last diary entry written by Granville “Granny” Gutterson before his death. Granny finally got his overseas orders and was set to ship out of New York on November 11th. When word spread of the signing of the Armistice the orders were cancelled and Granny’s dream of going overseas to fight the Huns was crushed. 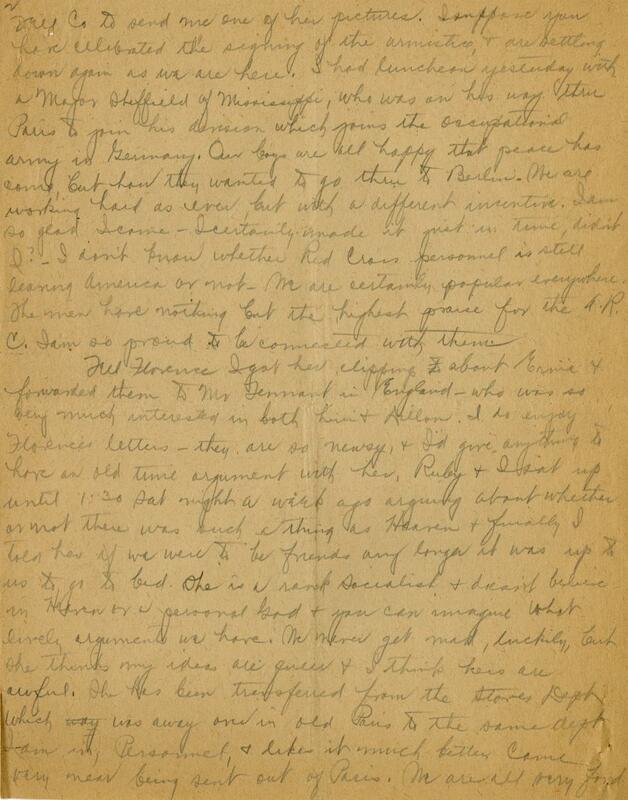 In this diary entry, Granny writes that he had received orders to go back to San Leon where he had been stationed for most of the war and added “I've got no change to get across now”. Granny also wrote that he would feel guilty for the rest of his life because many of his friends had died fighting in the war and he had not been able to be with them. 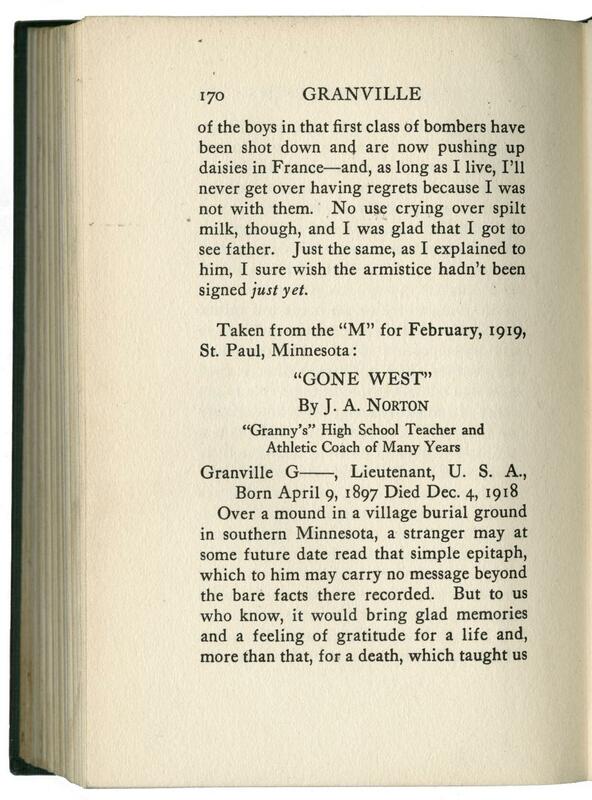 He ends this diary entry with “I sure wish the armistice had not been signed just yet”. On his journey back to Texas, the bad cold that he had contracted into a pneumonia. 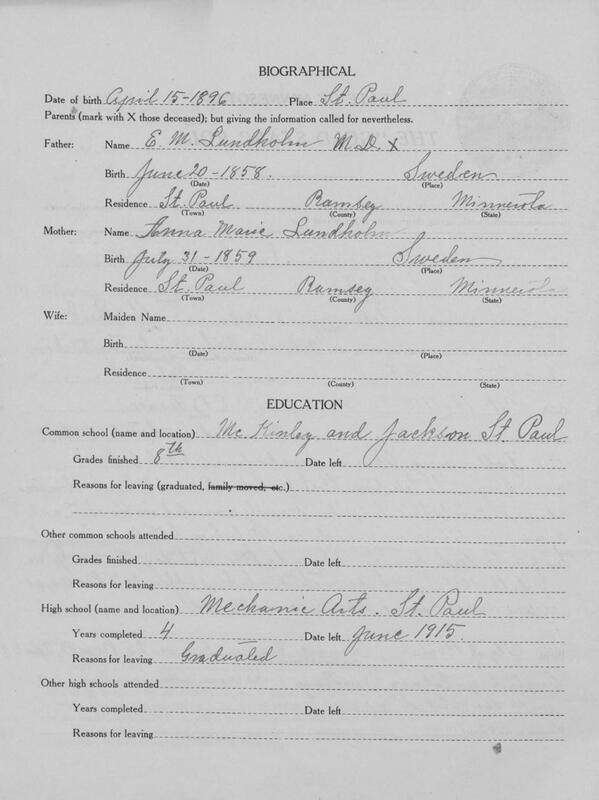 He died in Texas on December 4th, 1918 with his mother at his side. Granny's legacy is the wings he designed, which were worn by all U.S. Bombers. 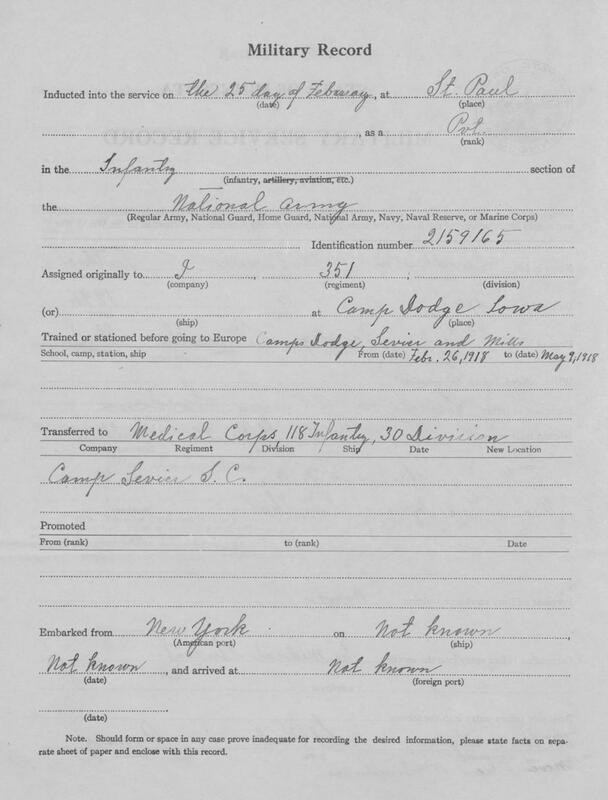 Even though he didn’t have a chance to fight overseas, Granville "Granny" Gutterson was able to leave his own legacy. Went out to camp to see what it looked like. Have not had to answer at the formation because of football. The rest of the fellows have to drill and stand two formations a day. Got out in the afternoon and found that they had just been looking for me, as there were some orders for me. Thought that the boys were kidding at first but soon got my orders to report to Ellington Field. Well, I’ve had a nice visit at this place! Was fortunate to be here at the time of the celebration and really am fortunate to get my orders back to San Leon, as I’ve go no chance to get across now. Got my orders without any “pull” at that, which is out of the ordinary. Am going to try to get home but rather doubt the possibility unless I can get them to date my departure ahead a few days, and that's rather risky business. Have a cold and a bad ankle, so I ought to be able to get plenty of sympathy along the road. Every one here puts themselves out to do you a favor in any manner possible. Even a little newsy walked two blocks with me to show me where I caught a car, and the conductors on the subways and cars all helped me on and off. A taxi driver who stood about four feet high wanted to help me out of the cab over in Newark, and if I'd ever fallen on him he would have been flattened. (Not flattered!) I haven't the least idea what the Govt. will do with me and care less! A number of the boys in that first class of bombers have been shot down and are now pushing up daisies in France- and, as long as I live, I’ll never get over having regrets because I was not with them. No use crying over spilt milk, though, and I was glad that I got to see father. Just the same, as I explained to him, I sure wish the armistice hadn't been signed just yet. 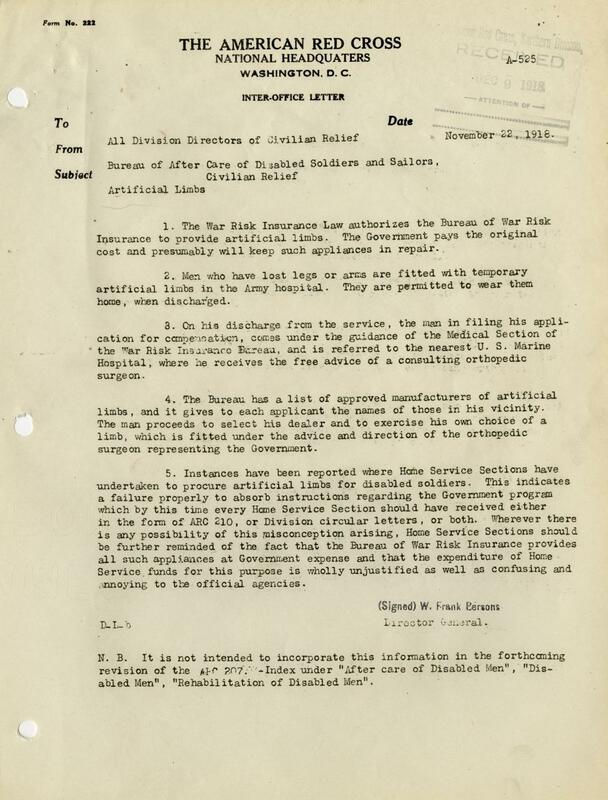 This letter sent from the National American Red Cross to its Division Directors of Civilian Relief on November 22nd address care of disabled soldiers. It describes the process that these soldiers should be instructed to go through in receiving artificial limbs. The military hospital that the soldiers are at should give out temporary limbs that they could take home with them but they should consult free orthopedic surgeons once they had been discharged. The government would pay for their artificial limbs that the orthopedic surgeons would create for them. There seems to have been some issues with Home Services Sections attempting to distribute artificial limbs, which the Red Cross finds, "annoying". [...] 1. The War Risk Insurance Law authorizes the Bureau of War Risk Insurance to provide artificial limbs. The Government pays the original cost and presumably will keep such appliances in repair. 2. Men who have lost legs or arms are fitted with temporary artificial limbs in the Army hospital. They are permitted to wear them home when discharged. 3. 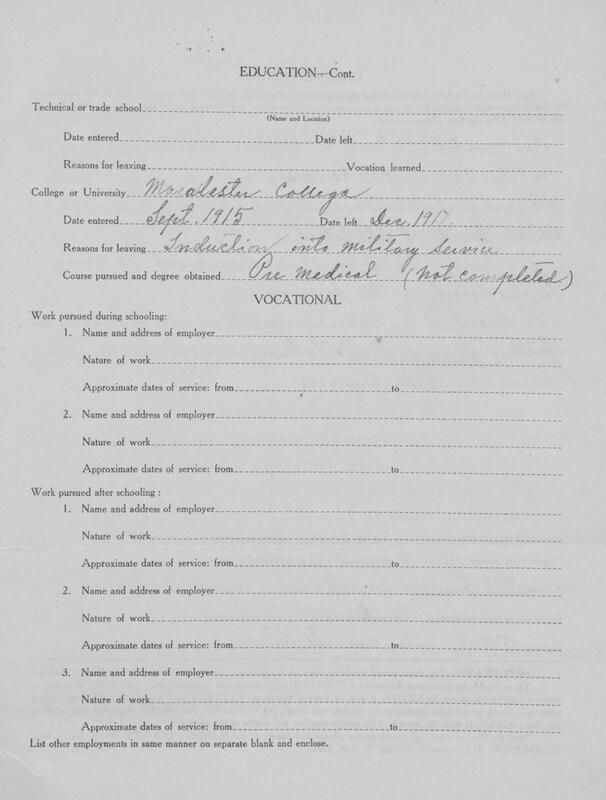 On his discharge from the service, the man in filing his application for compensation, comes under the guidance of the Medical Section of the War Risk Insurance Bureau, and is referred to the nearest U.S. Marine Hospital, where he recieves the free advice of a consulting orthopedic surgeon. "It's Just Grief and Woe Here All the Time for Someone"
Dee Smith was an office worker from Minneapolis for the Red Cross stationed at their Bureau of Personnel in Paris. 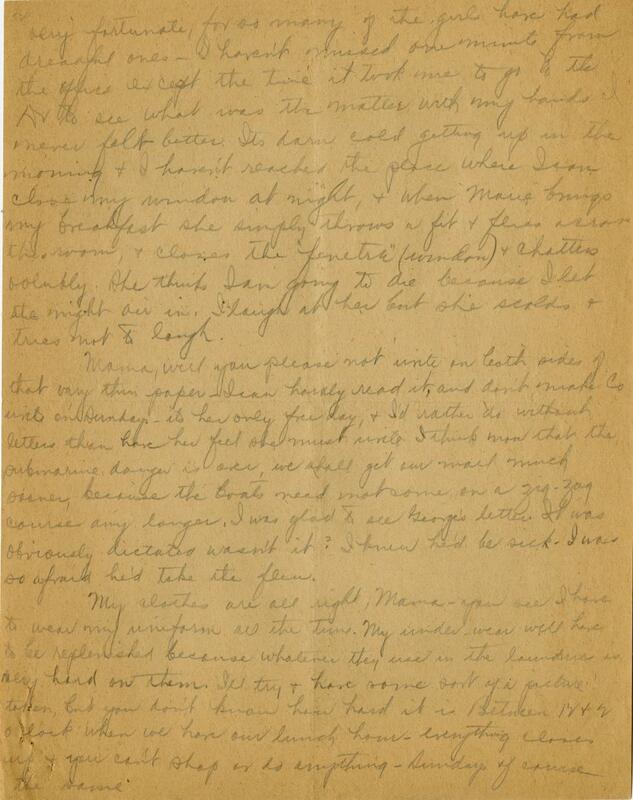 In this letter home she writes about her time in Paris, including the lack of heat and the joy about the Armistice. When writing about the various people she has met, Smith tells a story of kind soldier she became acquainted with and had showed her around Paris. She says that he has since died, and even though she only knew him a short time, she is filled with grief. Despite the recent peace, Smith and the other Red Cross personnel are working as hard as ever, but are doing so with different intentions. Even though the fighting was over, there was still work to be done by so many who were still abroad. 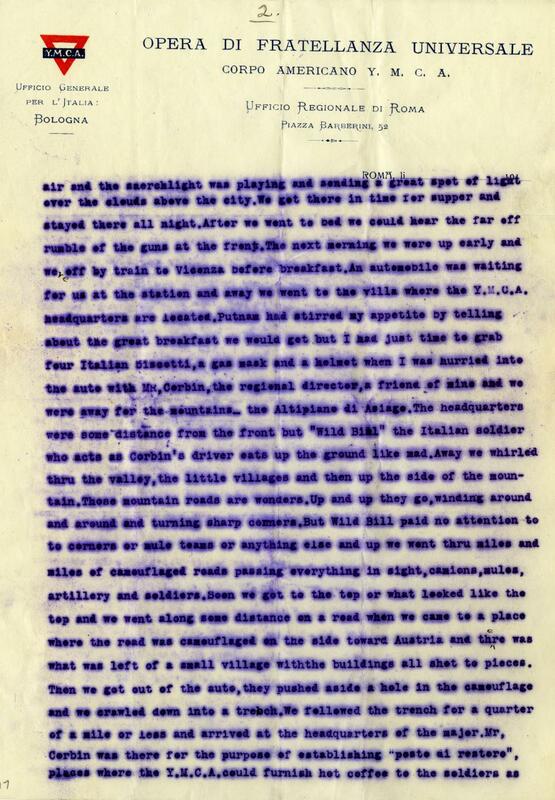 In this letter, written on a typewriter in the rain, YMCA secretary Paul Thompson writes to his sister Ruth about his experiences at the front a few days before the Armistice was signed. 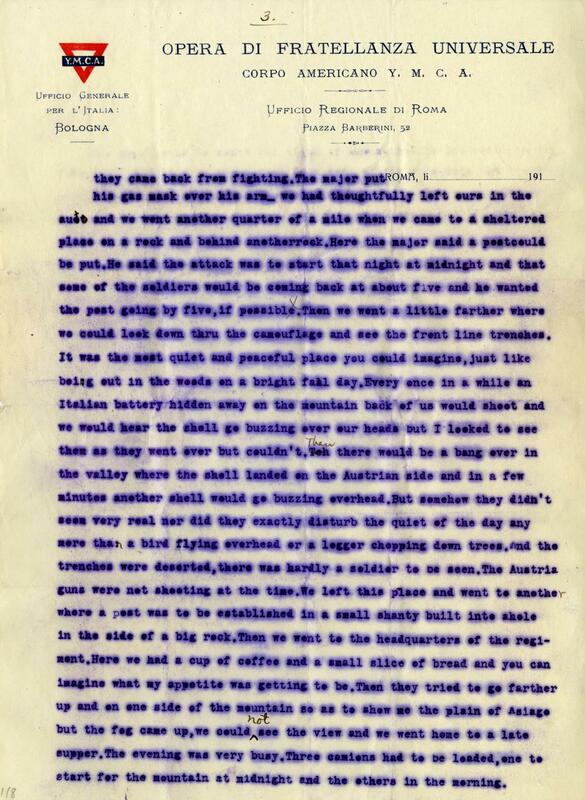 He writes about being in the trenches, on camouflaged roads and being in the path of shell fire. During these experiences he has collected several souvenirs, including shells and bullets that had hit the car he was escaping in, as well as a piece of the windshield from the same car. Even though Thompson didn't physically fight during the war, he was constantly up close and personal with danger.